The Meme cast and crew were thrilled to be able to participate in the 2018 Art of Brooklyn Film Festival. The organizers of the festival including Joe, Anthony, Stef, Jake, and Guest Director Victoria, were warm and welcoming from our acceptance through the week of the festival, which wrapped up the night of Sunday June 10th. We had a great turn out for our World Premiere screening the evening of Saturday June 9th. Cast, crew, and friends old and new turned out to support the film. We couldn’t have asked for a better premiere for this film we all worked so long and so hard on. 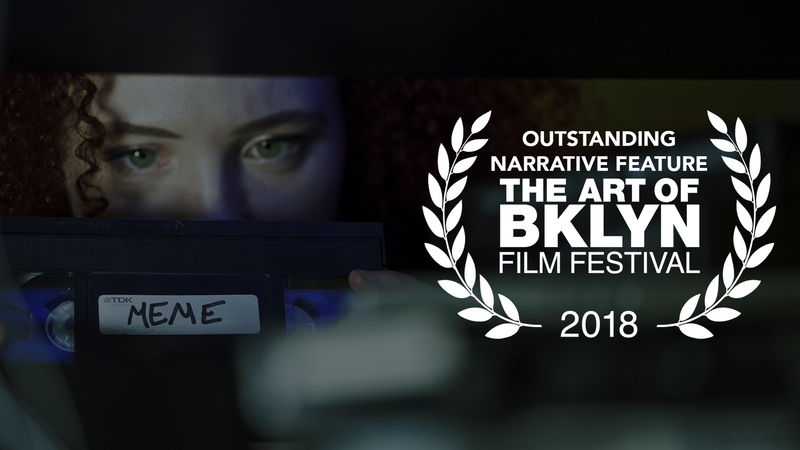 We are very thankful that The Art of Brooklyn Film Festival chose Meme, out of many other wonderful feature films at the festival, to honor as their Outstanding Narrative Feature for 2018. Among the other films we enjoyed at the festival were the short films “e.ro.sion, noun,” “Page One,” “Pair of Normals,” “Fresh Blood,” Cake,” “Press Play Already” and the features How to Say Goodbye, Black Memorabilia, Delenda,and Long Goodbye. It was a great experience being a part of the festival and screening alongside these films. Below is a gallery of photos from the festival. We’re very much looking forward to our next screening. More updates on that soon. A look at the crowd waiting for the film ahead of the premiere. Sean Mannion, Sarah Schoofs, Carolyn Maher, and Peter Westervelt at the Q&A for the film, hosted by Victoria Negri. Director Sean Mannion with the other award winners from this year’s festival.